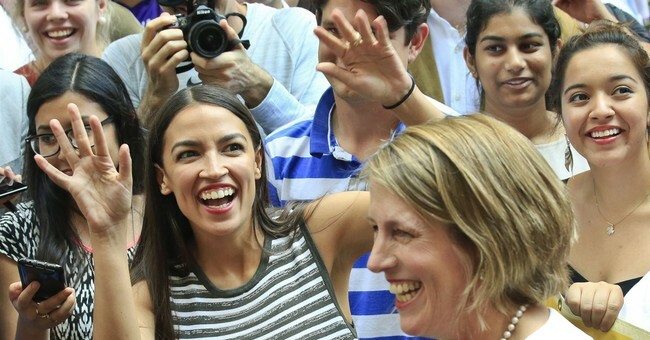 Alexandria Ocasio-Cortez may have beaten Rep. Joe Crowley (D-NY) soundly in New York's 14th congressional district race (and won a neighboring district race she didn't even enter), but some top Democrats are still urging voters not to buck the establishment quite yet. According to former Connecticut Sen. Joe Lieberman, the young progressive's radical agenda will do the party no favors. Not only did Lieberman basically tell New Yorkers to play it safe with the experienced lawmaker Crowley, but in a very detailed op-ed for the Wall Street Journal he warned his party what their future would look like if more Ocasio-Cortezes start winning elections. Because the policies Ms. Ocasio-Cortez advocates are so far from the mainstream, her election in November would make it harder for Congress to stop fighting and start fixing problems. Thanks to a small percentage of primary votes, all of the people of New York’s 14th Congressional District stand to lose a very effective representative in Washington. Fortunately, Joe Crowley and the voters in his district can prevent this damage. On Election Day, his name will be on the ballot as the endorsed candidate of the Working Families Party. But for Mr. Crowley to have a chance at getting re-elected, he will have to decide if he wants to remain an active candidate. I hope he does. Her "dreams of new federal spending would bankrupt the country," he adds. Lieberman's interjection into the campaign irked the Working Families Party, who had switched their endorsement from Crowley to Ocasio-Cortez. The group reminded voters that Lieberman was a "disgraced" washout. As for Crowley, he may have appreciated Lieberman's endorsement, but he rained on his fellow Joe's parade with three simple words. Democrats in Washington also tempered Ocasio-Cortez's win as an anomaly, not the norm. "They made a choice in one district," Pelosi said in her analysis. "So let’s not get yourself carried away as an expert on demographics and the rest of that." As you can see, Ocasio-Cortez's upset victory is quickly being overshadowed by intra party politics.